An amazing personal performance and the rise of the Turkish clubs are marking the 10th round of the Turkish Airlines EuroLeague. There’s a gap at the top of the standings after ten rounds in the Turkish Airlines EuroLeague. The top four has a two-win advantage over the teams which are tied at the fifth spot and as you can see in the results of this week, the favourites got their way. And nobody did it in a more impressive way, than our MVP. 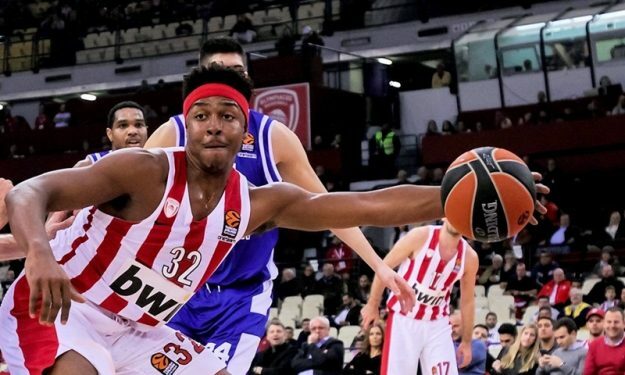 His performance was amazing with 28 points in just 21 minutes of action, eight rebounds and a 42 PIR in Olympiacos‘ win against Buducnost VOLI. His performance is the best ever in EuroLeague for a player of the Reds and finished the night with 9/11 FG (2/3 3p.) and 8/9 FT. It was the best performance of the season so far and one of the best ever games in the modern era of the competition. Cory Higgins: Will Clyburn had a much better PIR, but Higgins made all the big shots and got 24 points for CSKA Moscow in the big road win against Real Madrid. Marcus Erikkson: He had 23 points and four steals in Herbalife Gran Canaria’s road win against Darussafaka Tekfen, leading the EuroLeague newcomers to their third triumph of the season. Anthony Gill: No Shved, not problem for Khimki Moscow Region which got 21 points and five rebounds from Gill in the home win against Panathinaikos OPAP. Zach LeDay: He had his breakout game. Brandon Davies: He had an amazing performance that included a career-high with 27 points, 10 rebounds and four assists for a 35 PIR for Zalgiris Kaunas in the win over AX Armani Exchange Olimpia Milan. Maccabi FOX Tel Aviv needs to do a lot more than beat Bayern Munich at home, however, the fact that Sfairopoulos’ team scored 95 points and their opponents just 71 is a good sign for things to come. While Maccabi still has a mountain to climb, Sfairopoulos is already turning things around. While Darussafaka Tekfen is last in the standings with just one win, Fenerbahce is tied at the top with CSKA Moscow and a 9-1 record, followed by Anadolu Efes which is tied at the third spot with Real Madrid and an 8-2 record. And while this is not a surprise for Fenerbahce, the fact that Anadolu Efes has such a success after one-third of the regular season means that two Turkish teams can aim for the Final Four.